I check into a room that smells like a Pine-Sol explosion and cruise the two main drags looking for a meal. A pretty girl takes my order at a pizza place, and I realize for the first time what a physics town this truly is. Her eye shadow has been cross-sectioned into bandwidths, showing five different colors on each eyelid. It is a cosmetic display of the visible light spectrum. She smiles and asks if I’d like a beer. Fusion is the process by which two atomic bodies, driven together by an overwhelming force, merge to become one heavier nucleus. It is the reverse of fission, the splitting process that gave us the atomic bomb and the conventional nuclear reactor. An atomic act of coupling, fusion powers our sun and every other light in the night sky. At the National Ignition Facility here in Livermore, scientists and engineers stand at the threshold of tapping into that process to create a limitless supply of clean energy. When the stars burn out, we’ll make our own. Nuclear fusion results when two elementary particles collide and combine or fuse to make, even temporarily, a new particle. Illustrated above, Tritium, a heavier form of the hydrogen nucleus, collides with another form of the hydrogen nucleus Deuterium to form a new particle. The fused particle is not chemically stable, and quickly decays via the split decay mode into a neutron and a helium nucleus (also known as an "alpha" particle) and energy. Here, energy is the ultimate holy grail of the fusion process. The car is completely covered in bird crap. This isn’t just one or two droppings caked onto a dirty hood, but a carpet-bombing by a flock of irritably-boweled miscreants. Lynda, the public affairs officer assigned to chaperoning me through the facility, smiles apologetically and gestures toward the culprits in the dense trees that loom over the parking lot. 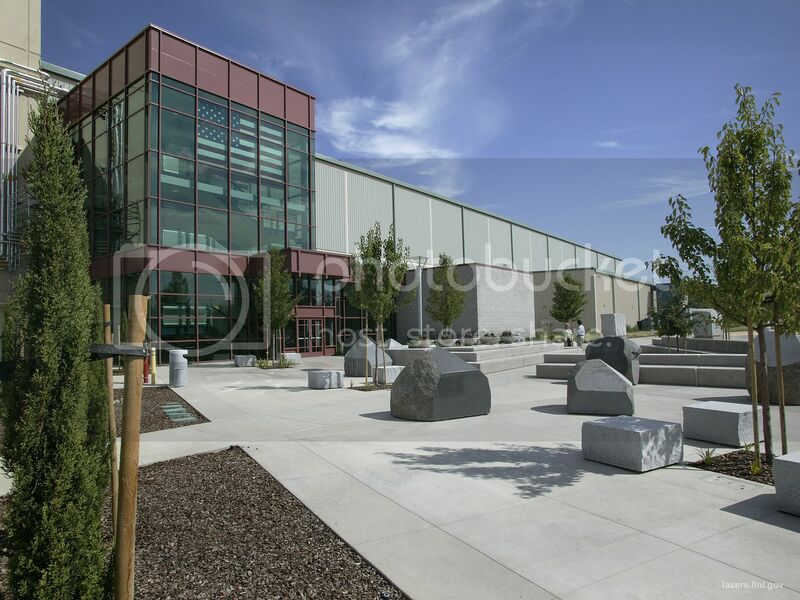 Like a quiet family home in mid-Los Angeles, the Livermore Lab hides from prying eyes with a protective wall of foliage that makes it look more like a nature preserve than a nuclear weapons facility. But behind the trees they have plenty of barbed wire and guards armed with assault rifles. I finger the clearance pass with my photo on it and thank her for the souvenir. She looks puzzled, “You won’t be allowed to keep it.” Bruno Von Wonterghem is exactly the sort of Germanic super-scientist you’d imagine running operations at the world’s largest laser facility. 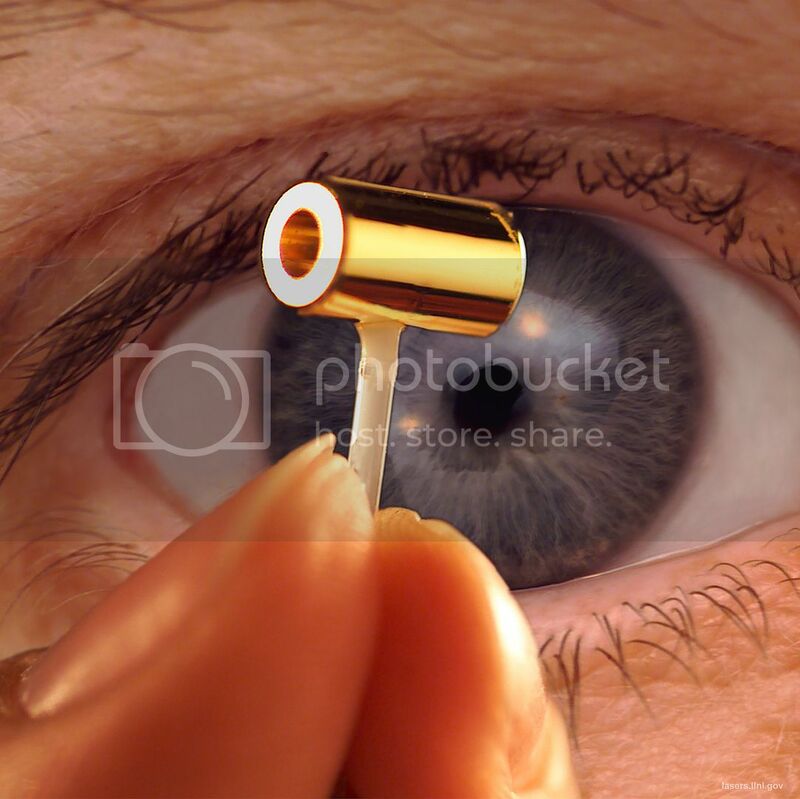 His accent lends an easy everyday quality to words like laser, optics, and Neodymium. He has the propensity to trail off into a mumble that could fill an entire page, like he’s been talking about the laser’s attributes merely for his own benefit. Bruno has been working on laser systems at the lab for almost two decades. Every time I ask a question this strange light comes into his eyes, as though he’s realizing for the first time that there are people in this world who don’t know about the National Ignition Facility. Outside of the National Ignition Facility. Credit: Lawrence Livermore National Laboratory. From the outside, the building doesn’t quite look real. It’s glossy, like one of those photos a developer might put up in front of a vacant lot to convince people that something could be built there. I’ve been trying to get into this facility for over a year, and to my disappointment it looks exactly like the pictures. Most of the facility’s iconic equipment is on display in the front lobby, and the walls throughout are lined with posters explaining how everything works. The whole thing screams field trip, and I’m starting to wonder if there is actually any science that takes place here. Then they show me the laser bays. 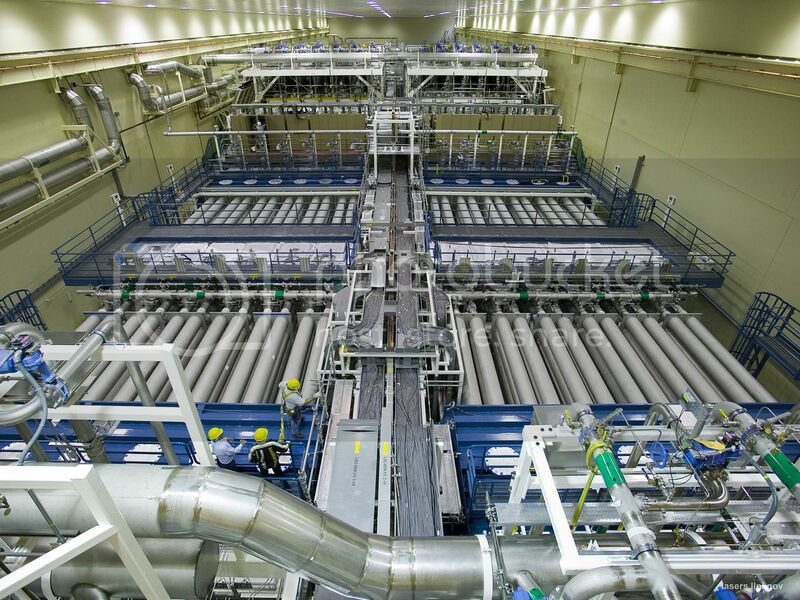 Laser Bay 1, commissioned in 2007, at the National Ignition Facility. Credit: Lawrence Livermore National Laboratory. Every article you will ever read about the National Ignition Facility measures the size of its laser bays in terms of football fields (four). It’s difficult to get a feel for the scale from the picture, because this is only one of two laser bays and what you don’t realize looking down on it is that the whole system is suspended a story above the ground, putting us three stories up. They do that because any replacement modules have to be loaded from underneath in pre-assembled clean rooms so that any outside particles will fall out of the system. 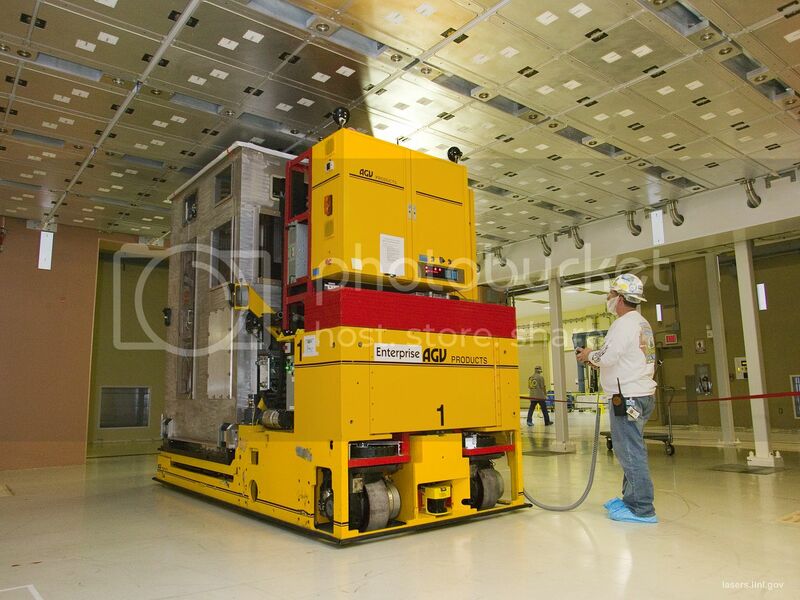 The laser bay transporter, an automated guided vehicle, is used to install canisters containing amplifier slab cassettes, known as line replaceable units, into the main amplifier frame assembly units. 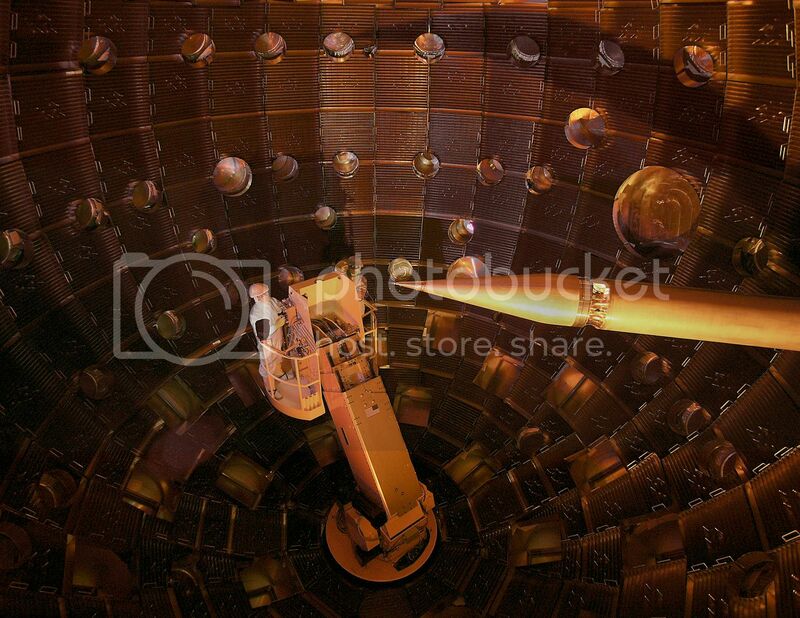 Credit: Lawrence Livermore National Laboratory. After giving me a minute to ogle, Bruno clears his throat. “The Facility is essentially an energy concentrator in time and space. It takes about sixty seconds to charge up the capacitor bank with six megawatts, but the laser releases that energy in a very short amount of time: billionths of a second. Those six megawatts are concentrated by over fifteen orders of magnitude, more power than the entire United States electrical grid.” The cool thing about lasers is that they have an unlimited threshold for delivering power. Photons, the packets that physicists use to quantify light, occupy no space, so you can pack an unlimited number of them into as focused a path as your lenses allow. The charge process concentrate the lasers through time, and the lenses concentrate them through space. 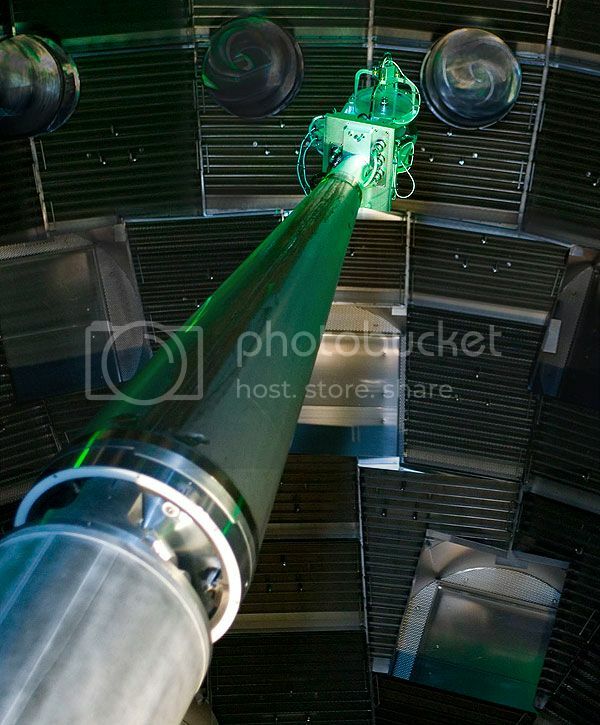 Each of the tubes acts like a telescope, converging NIF’s 192 beams onto a single capsule the size of a vitamin, gaining another nine orders of magnitude in the process to create temperatures hotter than the inside of the sun. This artist's rendering shows a NIF target pellet inside a hohlraum capsule with laser beams entering through openings on either end. The beams compress and heat the target to the necessary conditions for nuclear fusion to occur. 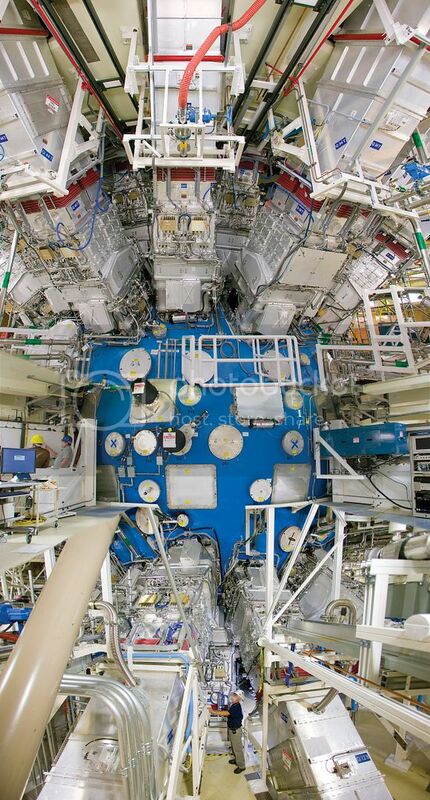 Ignition experiments on NIF will be the culmination of more than 30 years of inertial confinement fusion research and development, opening the door to exploration of previously inaccessible physical regimes. Credit: Lawrence Livermore National Laboratory. At the molecular level, heat causes vibration. The hydrogen ions in the fuel capsule are both positively charged, so they magnetically repel one another. However, the supercharged laser creates a perfectly symmetrical layer of plasma around the target. There’s nowhere for the ions to run, and as they heat up and accelerate to over a million miles per hour, the two cores inevitably fuse to become a hydrogen atom, releasing some of their mass as energy in the form of neutrons. Each laser bay contains 96 beams, one in each steel tube. Thick black high-voltage cables snake along the outside delivering power to the amplifiers. The tubes are filled with Argon gas because air reacts with lasers and impedes their progress. Aside from the amplifiers, the lasers also pass through pink slabs of neodymium that add juice to the discharge. The shot bounces through the entire array four times before it enters the switchyard into the target bay. 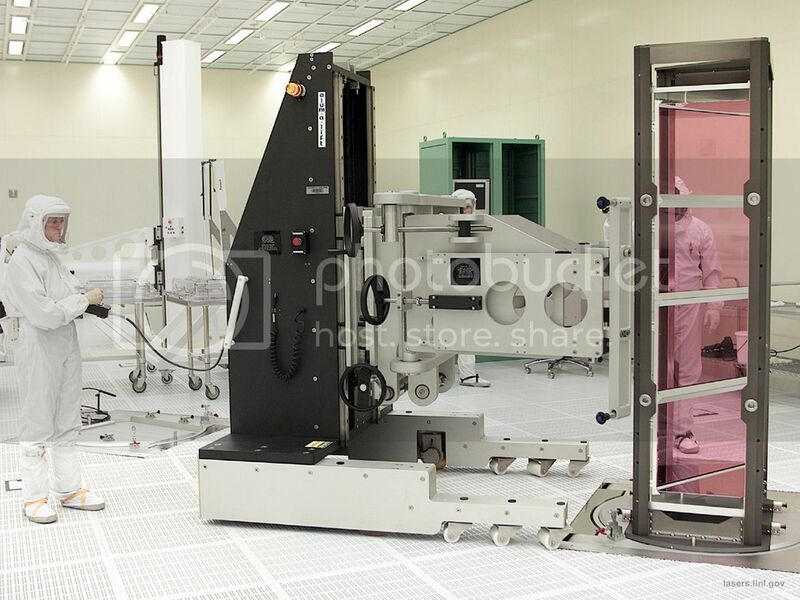 This is a laser glass slab in a line replaceable unit (LRU) that was assembled in the Optics Assembly Building cleanroom. An LRU is a large metal frame that holds various types of lenses, mirrors or glass that can be easily installed in a beamline or removed for maintenance. This glass slab LRU will be installed between two flashlamp cassettes that fire as the laser beam passes through, causing the beam to pick up energy from the specially treated glass on its way to the target chamber. Credit: Lawrence Livermore National Laboratory. Every shot starts in the Oscillator Room, which is a somewhat disappointing set of server-like cabinets containing the three oscillators that send out the initial pulse to the preamplifiers. This starting pulse is only a billionth of a joule, or 1/160th the kinetic energy of a flying mosquito. A fairly humble beginning for a star’s birth. They use the three oscillators in tandem to fine-tune the timing of the pulse down to a few trillionths of a second. The oscillators run constantly, but only one of these pulses will enter the amplifiers to begin powering up for a shot. 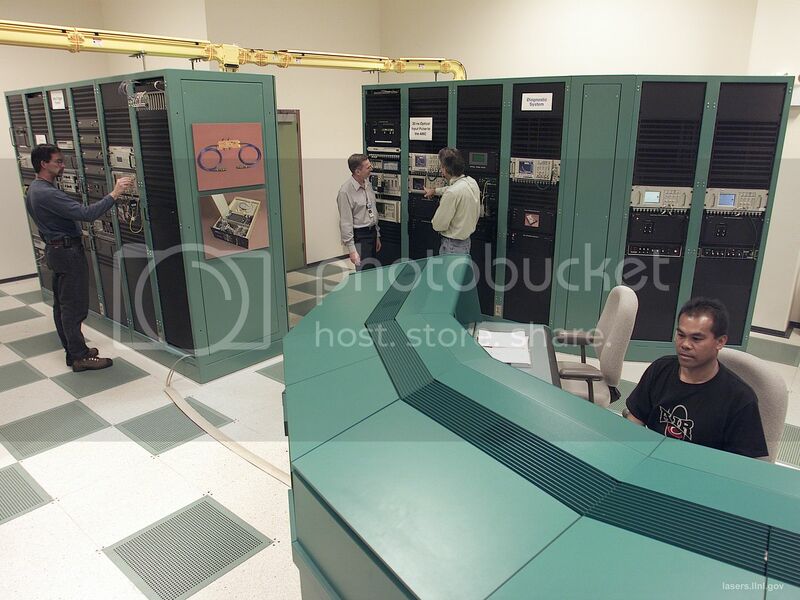 A large red counter keeps track of all pulses that pass without notice through the fiber-optics, unable to reach their full potential in the adjacent laser bays. 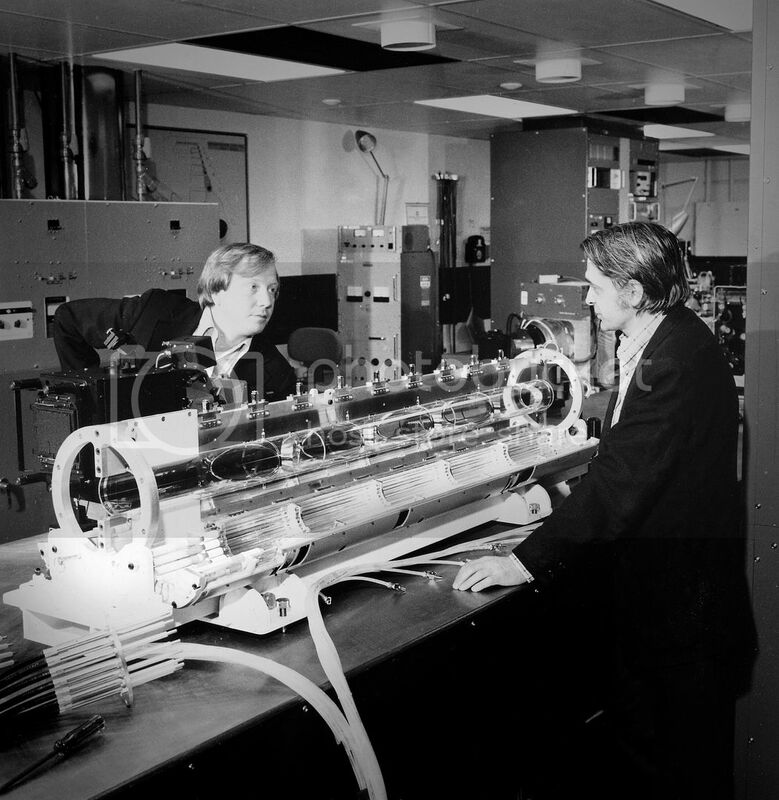 Physicists John Emmett (left) and John Nuckolls were the key Lawrence Livermore National Laboratory pioneers in laser and fusion science and technology. Emmett co-invented the multipass laser architecture still in use today. Credit: Lawrence Livermore National Laboratory. In 1957, John Nuckolls began investigating peaceful applications of nuclear weapons technology. 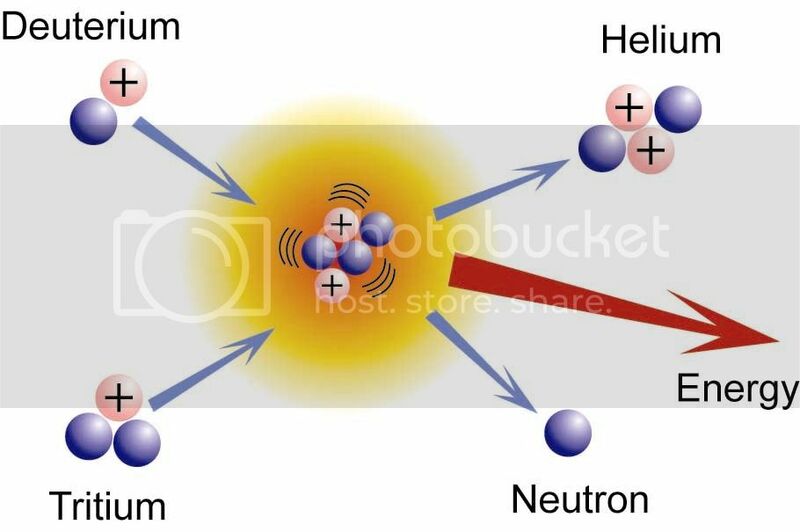 He proposed a novel scheme: the implosion of a Deuterium-Tritium (hydrogen isotopes) fuel capsule inside a tiny holhraum driven by an external energy source (refer to above graphic). This is the same scheme NIF uses today, but at the time when Nuckolls proposed it the laser had not yet been invented, so he considered other exotic power sources like particle accelerators, plasma guns, and hypervelocity pellet guns, which sound suspiciously like glorified BB guns. 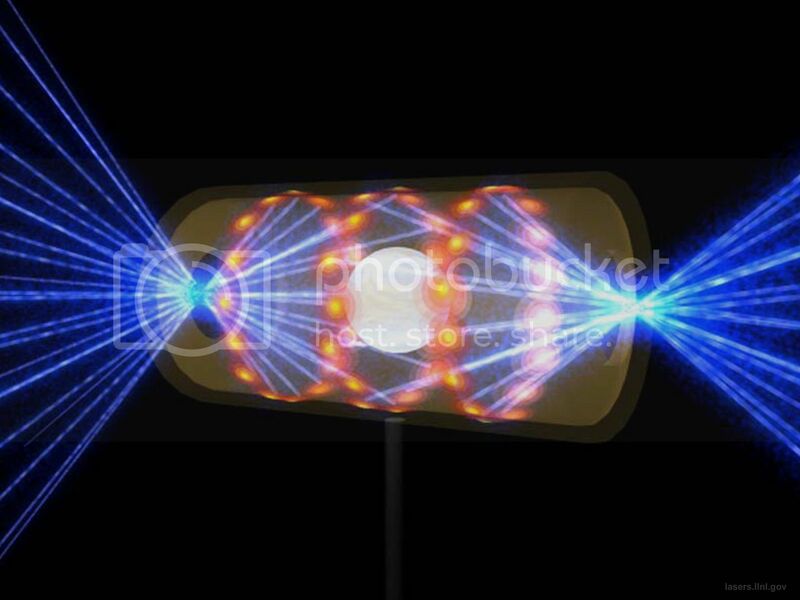 On March 10, 2009, at 3:15 a.m., a 192-beam laser shot delivered 1.1 million joules of ultraviolet light to the center of the target chamber - the first time any fusion laser has broken the megajoule barrier (a megajoule is the energy consumed by 10,000 100-watt light bulbs in one second). Credit: Lawrence Livermore National Laboratory. The target chamber is a 10-meter diameter aluminum sphere with laser tubes sprouting from its surface. From the outside, it looks like one of those alien objects from Contact or Sphere. It spans three stories of the facility, so you can only ever look at it from above or below. We stand on the third floor watching a crew of workers install some newly hardened diagnostic equipment. They’ve spent the past six months preparing the target chamber to absorb the massive amount of energy released by the fusion reaction. The entire chamber is now surrounded by a concrete and boron barrier two meters thick. In the LIFE facility, a commercial power plant designed to actually generate electricity, the neutrons will be absorbed by a mantle of liquid salts that transfer their kinetic energy to heat energy which drives a conventional steam generator. However, because NIF is an experimental facility where they actually need to observe the reaction, its physicists were presented with the challenge of preparing cameras that could withstand the bombardment, since neutrons lay waste to electronics. A NIF hohlraum. The hohlraum cylinder, which contains the NIF fusion fuel capsule, is just a few millimeters wide, about the size of a pencil eraser, with beam entrance holes at either end. The fuel capsule is the size of a small pea. Credit: Lawrence Livermore National Laboratory. Holhraum is the German word for “hollow room.” It has been mostly analogized to a pill capsule, in reference to its size and shape. Its role is to act as an x-ray oven, containing the plasma generated around the target pellet and acting as a mold for the fusion reaction’s symmetry. The holhraum contains the fuel pellet made up of the hydrogen isotopes Tritium and Deuterium. There’s no danger of scarcity with these two elements: Tritium is derived from the relatively common Lithium and Deuterium comes from plain old water. Another advantage to fusion is that there’s no waste created, at all. Everything is consumed by the reaction, leaving behind no toxic radiation or weaponizable elements. In fact, physicists can use facilities like NIF to dispose of the nuclear waste from the previous generation of fission reactors, rendering the arguments about Yucca mountain or blasting it into space completely moot. The National Ignition Campaign coincides with football season, but the stakes are a little higher. Ignition is the validation of fusion as a viable energy source, the point at which the critics are silenced and the rest of the world scrambles to duplicate the feat. “It’s going to be incredible, standing room only. There’s people lining up around the world that want to be here for that event. Every milestone along the way has been a major event, when we went from two to four lasers it was a major event. Now we have 192. And it’s all leading up to the ignition.” The question they must get tired of hearing is: when? “September, October. There’s a few [target] options we have, a plastic capsule, a beryllium capsule, a diamond capsule.” I ask Bruno which one he thinks will do the trick. It’s important not to underestimate the technological perfection required to achieve the symmetry necessary for the ignition. Every aspect of the shot must be analyzed and optimized to an order of precision never before achieved. With all that said, he doesn’t see any reason why the plastic capsule won’t get the job done. Are you ready for some Physics? The above title sounds a lot more enticing if you sing it to the Monday Night Football theme song. There’s no good reason why I should be allowed into a nuclear weapons lab. I’m nobody, another starving bookworm with a taste for Faulkner and single barrel scotch. All I can surmise is that so far, no-one’s managed to pull this four billion dollar sword from its stone and shove it somewhere that will make the American public pay attention. I’m living proof that they’re desperate. No one I know has even heard of the National Ignition Facility, which quite sadly included the Editor of ScriptPhD.com who sent me there. I’ve spoken with professional engineers and physicists who don’t recognize the name. There’s certainly been plenty of media coverage: the BBC, the Discovery Channel, Wired, Time. People’s ears tend to perk up when they hear something might kill them, but the general public hasn’t had a survival-based reason to pay attention to physics since the end of the Cold War. We know that unruly nations getting access to nuclear weapons is a bad thing, but as to the current state of the field, a nuclear warhead is implicitly bad enough that there’s been no reason to continue following their progress. Fusion offers us the solution to a problem most people don’t even know we have. The immediacy of it isn’t so clear, but in his excellent BBC Horizons: Can We Make a Star?, Professor Brian Cox paints a grim picture. It’s not possible to give the rest of the world access to even half the electricity that the average American uses without bankrupting all possible means of generating electricity, and in the process laying waste to the environment. We have to figure out how to generate electricity for the growing population around the world without, as Bruno likes to say, choking ourselves. The actual numbers are sobering, but it’s a subject people don’t like to read about because in the past there’s been no clear solution. Now here we are, being handed that solution on a silver platter by a group of individuals that no one’s heard of who have been working on that solution for the last fifty years. Which only makes the endeavor that much more noble. Clean power is only the beginning. Like the technologies that emerged from the Pandora’s box of quantum mechanics, fusion will undoubtedly open up a whole new wave of technological advancement. 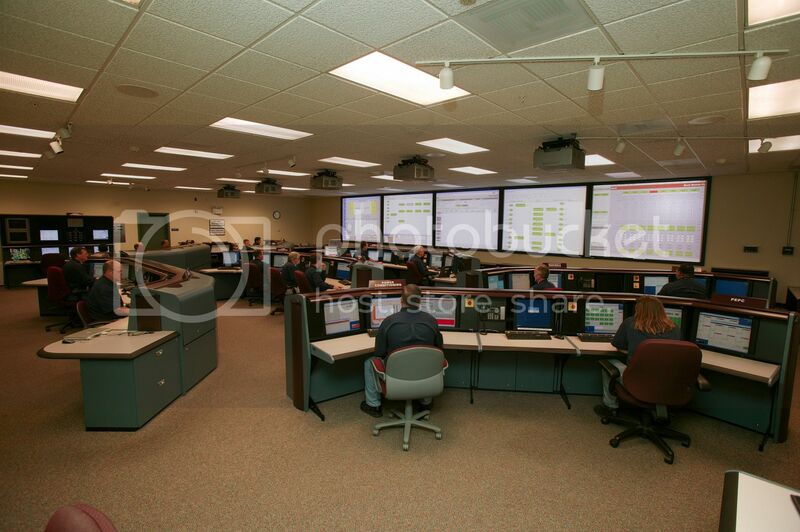 Every aspect of the National Ignition Facility, from the optics that carry the lasers to the supercomputers that process the data have pushed the limits in their field. Bruno gives me a sly look. “We probably have no idea yet what applications will come from having a neutron source like this.” And thanks to the NIF’s tireless believers, we enter that neutron age this fall. Stephen Compson studied English and Physics at Pomona College. He writes fiction and screenplays and is currently working toward a Master of Fine Arts at UCLA’s School of Theater, Film & Television. Previous PostGuest Post: Is Brain Training Real?Next PostEDITOR’S CHOICE: It’s Not Easy Being Green: Cool It! I grew up in Livermore and had generations of family that worked at the lab. Its amazing its been around for so long and the breakthroughs that they’ve had there. We used to drive out to the windmill fields as teens. There is a hill by the lab that if you put your car in neutral it will pull you up the hill. Not an urban legend. I’m so glad to see an article which specifically focused on this little known facility. Unfortunately, many members of Congress see this research as wasteful. As this country’s leaders continue to subscribe to the business practice of “immediate returns, NOW”, the USA will continue to fall behind as time moves on. The “only” reasons the USA hasn’t declined more rapidly is due to the shear number of research facilities, and the amount of money we have as a nation.